Ecocide on this scale should have been one of the biggest stories of 2015, but with the exception of Guardian columnist and environmental activist George Monbiot (who attacked his industry for censorship of the event), the tragedy was largely ignored to protect corporate interests. As was previously reported, the Indonesian wildfires that caused devastation to the country’s people and wildlife last year were largely ignored by the mainstream media until several months after the devastating event began. The fires were started by loggers to clear the way for controversial palm oil plantations and caused health problems for over one million people. 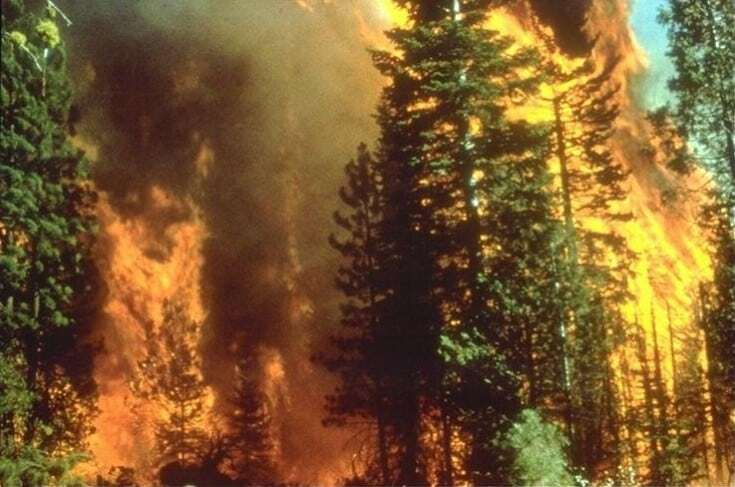 The World Bank estimates that the fires destroyed 2.6 million hectares (6.4m acres) of rainforest between June and October, costing $16.1 billion and causing an untold loss of life to the endangered animals who depend on the forests for their survival. Terrified orangutans fleeing the disaster were abused in a sickening way by some Indonesian villagers. The terrorist attacks in Paris were used as justification by the French, British and German governments to join military strikes in Syria. They were also used as justification by the French government to severely restrict freedoms at home. Immediately after the terrible events of November 13, the French government began closing down alternative news sites. The President also declared that anyone’s house could be searched without a warrant, websites could be blocked without warning, and citizens could be put under house arrest without a trial. Activists hoping to march in Paris at last month’s Climate Conference were disappointed to learn that France’s state of emergency also included a ban on protests. Some French politicians are pushing to install GPS trackers in rental cars, re-write the Constitution to allow for martial law, block free wi-fi and Tor, and combine state databases, which would give the state access to citizens’ personal medical records. “I’m currently living in Paris, the city where some fanatics killed people because they were listening to music, watching a football match, or simply enjoy beers in a bar. I was living in the neighborhood of where those tragic event happened. Now I’m scared. France’s emergency measures were reported by the mainstream media, but there was little analysis or debate about whether they are justified: the myth that we have to trade in our freedoms in order to establish security has become a normal part of everyday life. Could be part of a bigger geo-political plan by the USA and Britain to destabilize the region, using the corporate press to lie to the public in order to gain popular support for more endless oil wars. The mainstream media continues to peddle the tired old narrative that the Western coalition are in Syria specifically to fight the Islamic State. If this were true, it would be logical for these countries to support Russia in its war against the terrorist organization. Yet coverage of Vladimir Putin in the corporate press continues to be entirely negative, despite the fact Russia single-handedly took out 40% of the Islamic State’s infrastructure in just one week. The revelations above have been completely censored by the corporate press, which is becoming less credible by the day. The words in this image are taken from a real and very worrying speech by UK Prime Minister David Cameron late last year. Protests against TTIP have been widespread in Europe. The TTIP (Trans-Atlantic Partnership Agreement) TISA, (Trade in Services Agreement) and TPP (Trans Pacific Partnership Agreement) are highly controversial and top secret deals that will affect the lives of every citizen of the planet, yet we apparently have no right to decide whether we want them- or even to know the exact details of the draft legislation. TTIP, in particular, is of huge concern. As we have reported, the deal threatens to allow corporations to sue governments who don’t do as they are told, kill online privacy, make fracking standard procedure across 28 countries, privatize European health systems, force GMO food on unwilling citizens, strip us of our civil liberties, and ensure that corporations have control over the European parliament.